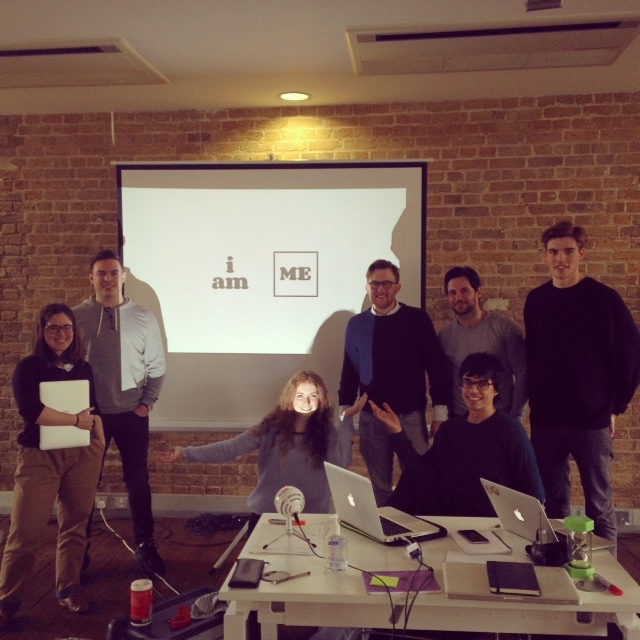 Here’s the team with clients, Tom and Amar, on day 1 of final project weeks. In the past few months Makers have been inviting external clients, usually charities, to pitch ideas at the jamboree in Week 9. Charities were selected this time around too: the Snow Angels group, for example, worked with a Sussex village charity to automate the organization of support for elderly people during times of adverse weather. My team’s project, though, came from Tom and Amar, two ideators local to Shoreditch. “I Am Me” is born of the frustration of spending Saturday mornings scanning TimeOut and similar sites for suggestions of what to do on the weekend. Though such sites have a lot of content, it’s presented within a cluttered interface and without regard to the particular user’s interests. To boil it down, “I Am Me” is an event discovery website that has the form of a calendar. My team and I had some concerns going into the project: which features could we fulfill on in the two weeks available? Should we stick to the design brief or experiment? In the end, we turned out a product that we could all be proud of. Users of the site can browse and create events with a visually appealing UI, and we even implemented some event-discovery, albeit of a primitive kind. Our presentation at the graduation event on got a good reaction. We did a good job of getting it clear in our heads from Day 1 what we were designing and what kind of user it was for. We didn’t think so deeply about the flow of the user’s experience through the site. Storyboards would have helped in this regard. Use technical language carefully; make sure everyone is on the same page. People have different assumptions about what certain design decisions would entail. It always helps to have people rephrase what they mean, or think they mean. Never Rails scaffold! Bad Things will ensue. There were many highlights. I was blessed again with a team of fun and talented people from whom I learned a lot.